I bought a new Oud (11 strings). It has been a week and still I can't get it tuned. Does anyone know how to tune it? I was told it should be tuned this way: (C F A d g c), but I don't know what big letters and small letters mean in this case. I also want to know, what does the number means, where it says (Mhz) on the tuner. 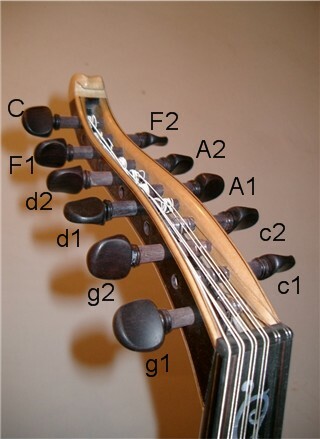 The Capital letters are the lower pitched, bass strings and the Lower-Case letters are the higher strings. So your bottom C is a single string, and the others are tuned as matched pairs, with your top four strings (A d g c) as fourths. I would start with your A, then tune your F and C downwards from there, and then work upwards tuning your higher strings. It doesn't really matter, but if you are having trouble this should make it easier as you should be able to tune fourths without the tuner. Regarding the 440 - that is the most common standard for A to be tuned to. So if your tuner is set to 440Hz I'd recommend leaving it there. Not the answer you're looking for? Browse other questions tagged tuning oud or ask your own question. Is it normal for new bought ukeleles to be out of tune every few minutes? Is it normal for an Oud/Lute not keeping in tune?